Components: Rocking Horse, Soft Shapes, Soft Piano, Water Bed, Slide, Inflatable Trampoline, Rocking Boat, Soft Piano, Colorized Ball Pool, Soft mini-trampoline, Soft Mat, Software Educational Building Blocks Toys, Climbing Ladder, Climbing Tunnel And Pipe Slide, etc. Components Rocking Horse, Soft Shapes, Soft Piano, Water Bed, Slide, Inflatable Trampoline, Rocking Boat, Soft Piano, Colorized Ball Pool, Soft mini-trampoline, Soft Mat, Software Educational Building Blocks Toys, Climbing Ladder, Climbing Tunnel And Pipe Slide, etc. 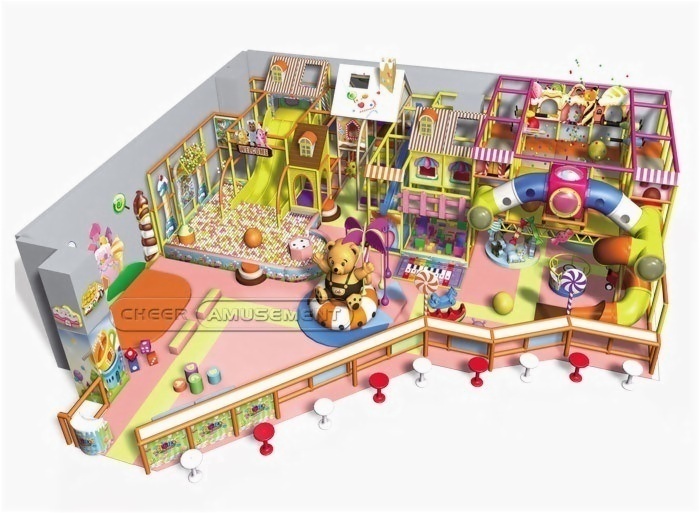 This is a new theme park, “Cheer Amusement” specially for you create it. Now, I'd like to introduce to you this amusement park. This medium size naughty castle is based on happy candy theme, The colours match well and overall modelling unique, lively and interesting. The toddler amusement area contains rich entertainment equipment - Rocking Horse, Soft Shapes, Soft Piano, Water Bed, Slide, Inflatable Trampoline, Rocking Boat, Soft Piano, Colorized Ball Pool, Soft mini-trampoline, Soft Mat, Software Educational Building Blocks Toys, Climbing Ladder, Climbing Tunnel And Pipe Slide, etc. can satisfy 3-15 years old children climbed, jump, run, throw activities requirements. And children can invite partners play together, increase the kid's interaction and communication skills for children to provide more fun. The overall colour feeling of this toddler playground is very good, very coordinated, and very fantastic. In equipments appearance, many are used animal image as decoration, these are very popular among children. This toddler playground is suitable for most of the play centers, amusement parks, shopping malls and so on, area is large size, the longest part of 16 meters, the width of 17 meters, the highest 4.5 meters. The toddler playground can accommodate 25-35 children to play. The playground is medium in size so that can hold more children play together, and it is fit for the younger babies, plus beautiful external form, novel type, sturdy and durable. And well received by the customers love and praise. Every weekend we will prepare special theming activities. We promise kids will get a good environment to play and learn here.